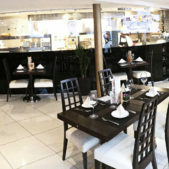 Blue Moon Restaurant is a refreshingly, modern Thai restaurant located in Lancaster. We strive to offer the very best in the quality of our food and service through creative and careful attention to detail. We specialise in good quality Thai cuisine and employ professional Thai chefs. Our restaurant is fully licensed and air conditioned. We cater for private functions and booking is advisable. Whatever the occasion, we provide fantastic value for money with the finest Thai dining experience. Only fresh and the very best and authentic ingredients are used. Our chefs have pride in their abilities and do not use MSG. Try Blue Moon for the healthy and tasty alternative.